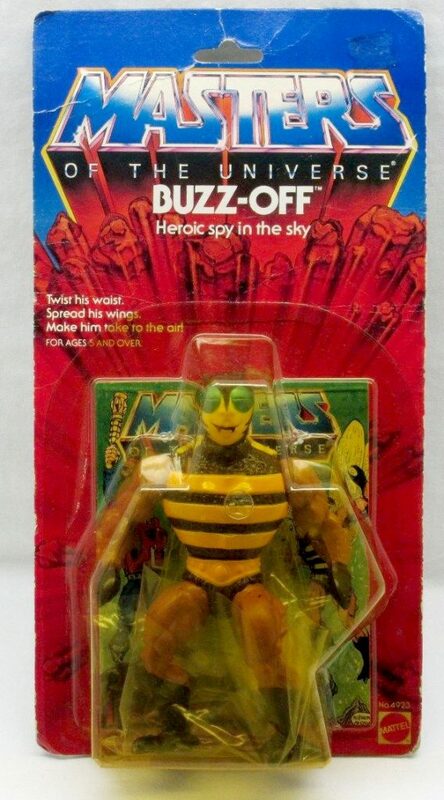 Buzz-Off is one of those figures that I never owned as a kid and had limited exposure to in general. I remember seeing him only once in the wild – when visiting some distant relatives for the first time. 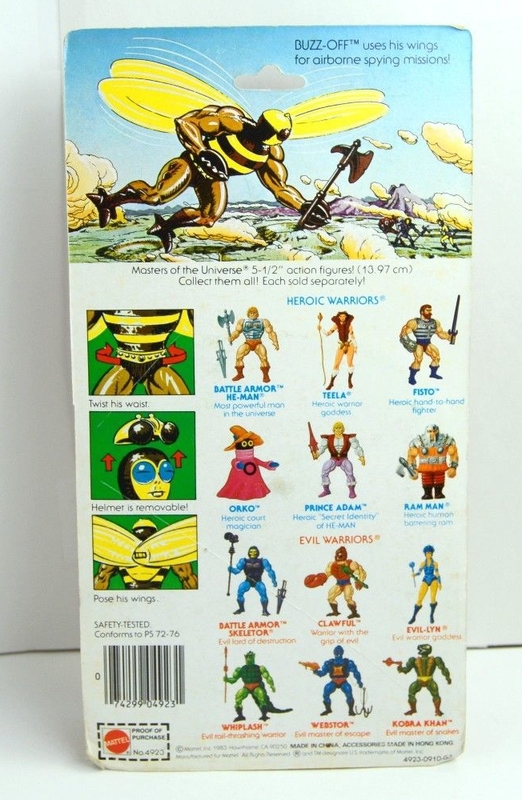 I remember their son showing me his He-Man collection, which included Mekaneck and Buzz-Off (the first time I had seen either figure in person). My exposure to him as a character otherwise was mostly punctuated by his appearance in the Filmation cartoon episode, “Disappearing Dragons”, and his inclusion in a couple of my favorite mini comics. 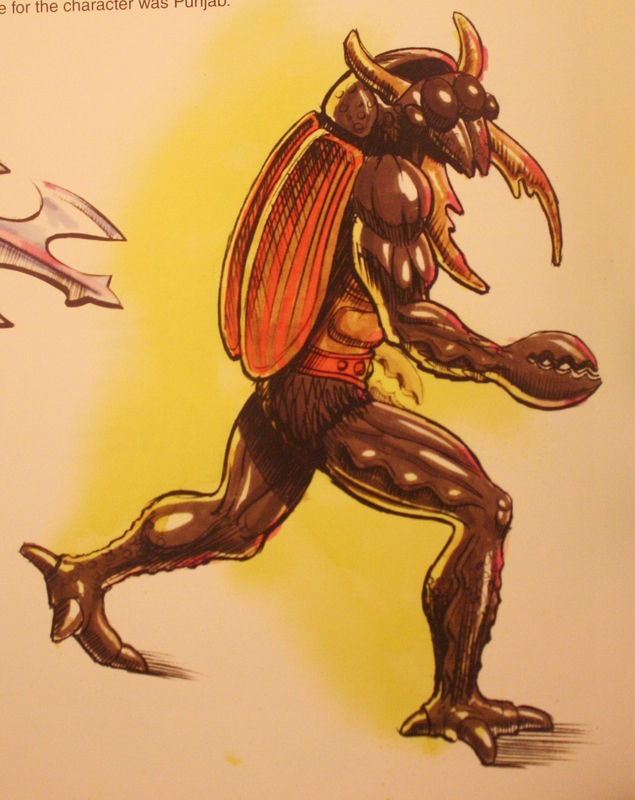 BUGOFF* – part man, part beetle, but with high-tech wings, flies swiftly and fast. His sword and lance are his stingers. 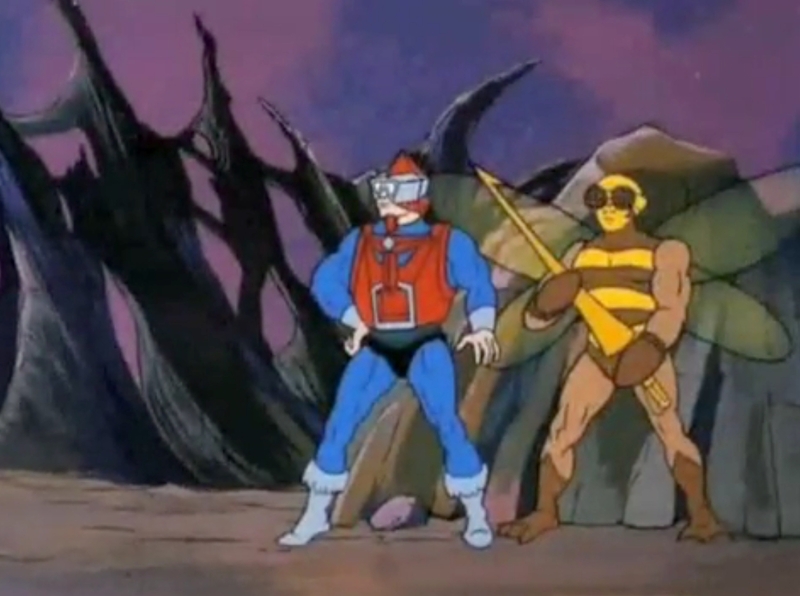 Bugoff’s beetle-like armor protects him from many dangers including some of the laser weapons of Skeletor and his crew. 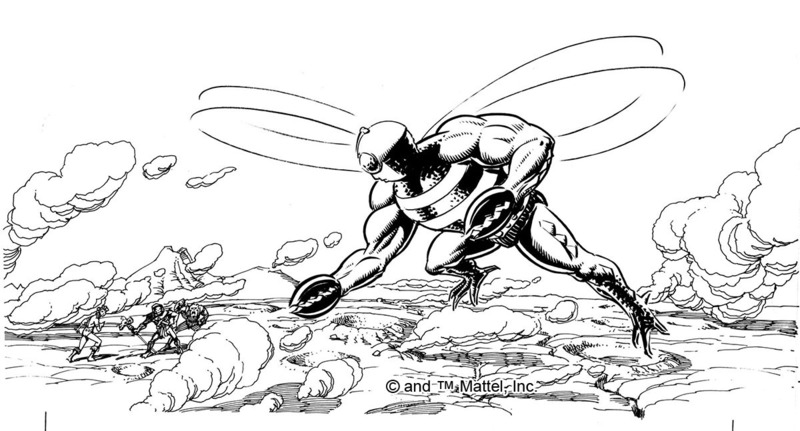 In July of 1982, Colin Bailey finished an illustration of a character called Wasp Man, who has many design touches in common with the final Buzz-Off action figure. 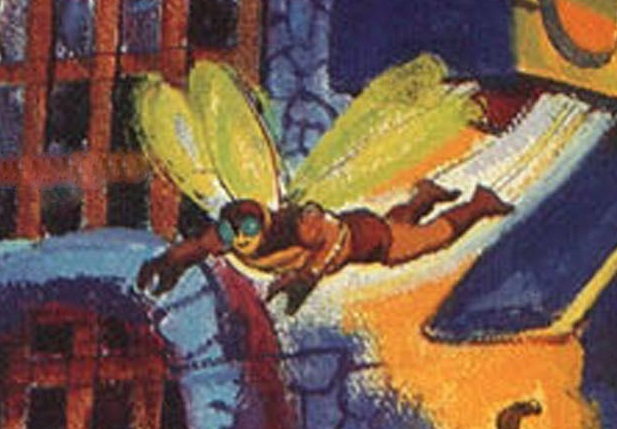 He has the wings pinned to his back, the yellow and brown striped chest, the helmet with the enlarged insect eyes, the clawed hands, and the enlarged monster toes. There are a few differences from the final figures as well. 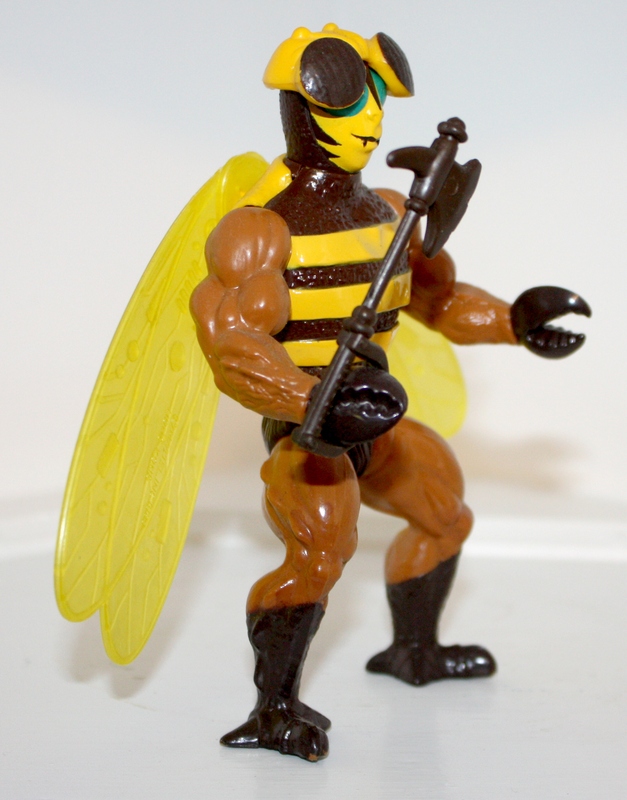 Wasp Man has spiny protrusions on the sides of his lower legs, and it looks like his clawed hands were supposed to be gloves. His thighs lack the bony protrusions of the final toy. He has white fur around his shoulders and head, and his wings are white and almost moth-like. 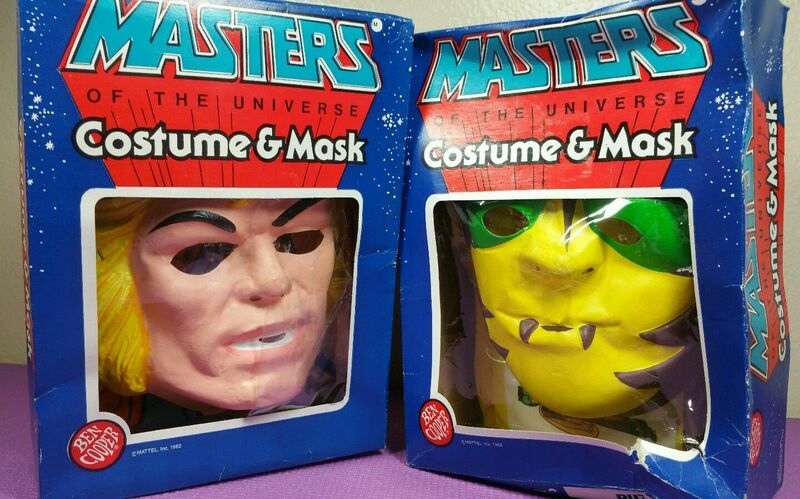 But the most obvious difference is the head – it’s a reuse of He-Man’s head. 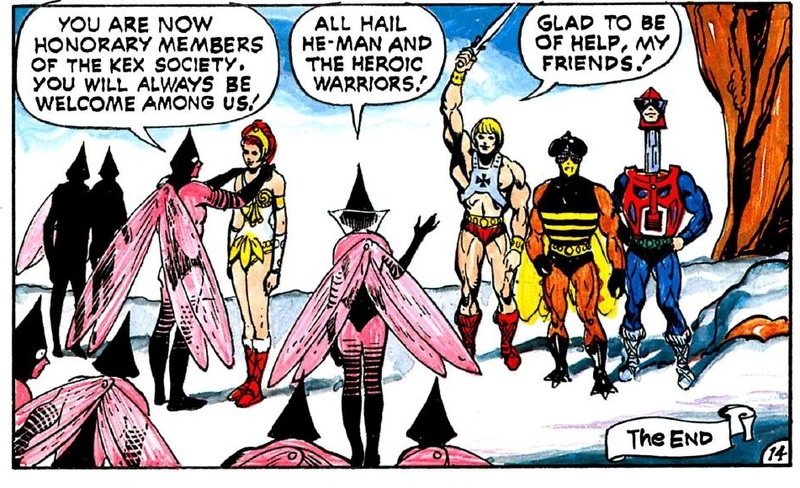 From the working name Wasp Man it doesn’t sound like he was supposed to be a kind of He-Man variant, so the idea of reusing the head from the main protagonist in this way is rather bizarre. 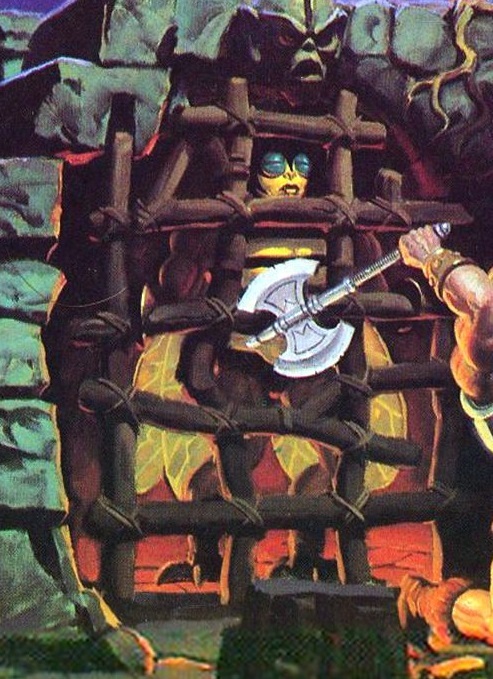 Then again, it’s possible that part of the original He-Man head was used as a basis for Mekaneck, so it’s not unheard of. 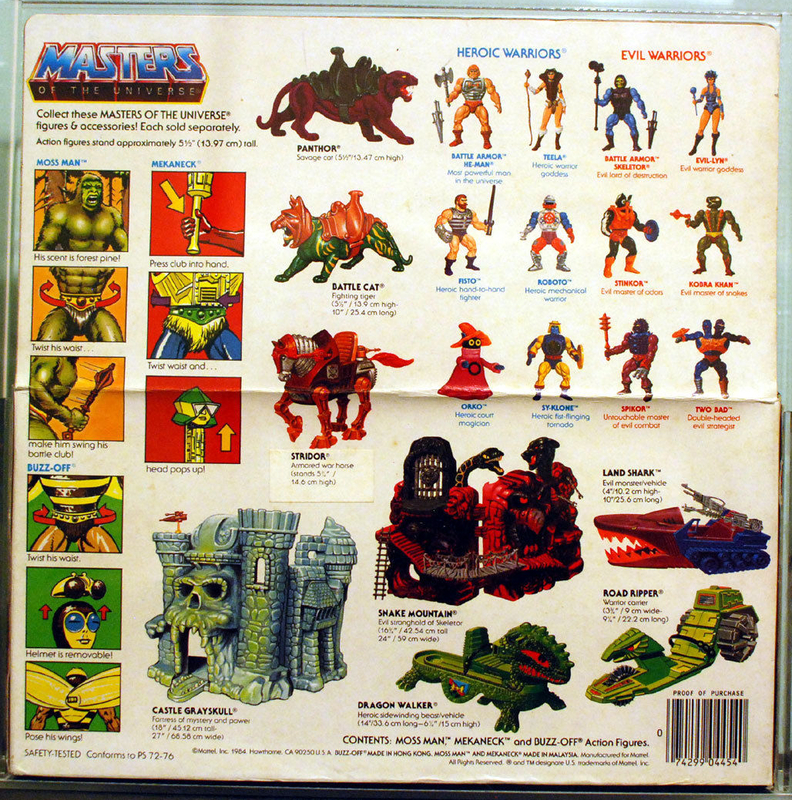 In this early mock-up of the figure (below), we see a hand-painted mashup of parts, with He-Man’s head (with brown hair instead of blond) and limbs borrowed from Zodac. The striped chest on this piece almost seems to resemble a rib cage. 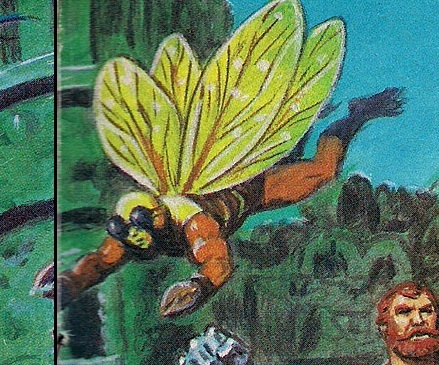 You can see some very thin insect wings on his back, and of course a large helmet with a somewhat creepy-looking insectoid face. 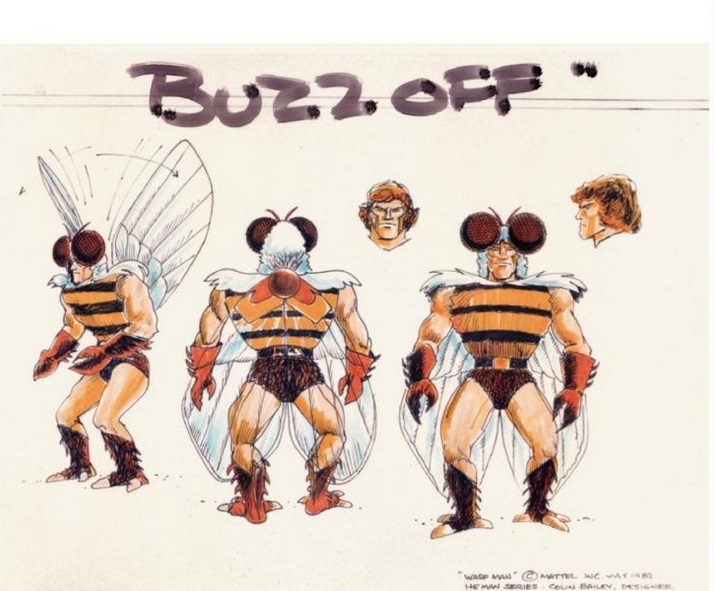 Given the parts used here, as compared to the concept drawing, it’s likely that Buzz-Off’s limbs had not yet been sculpted, and the designers went with the closest analogs they had on hand. 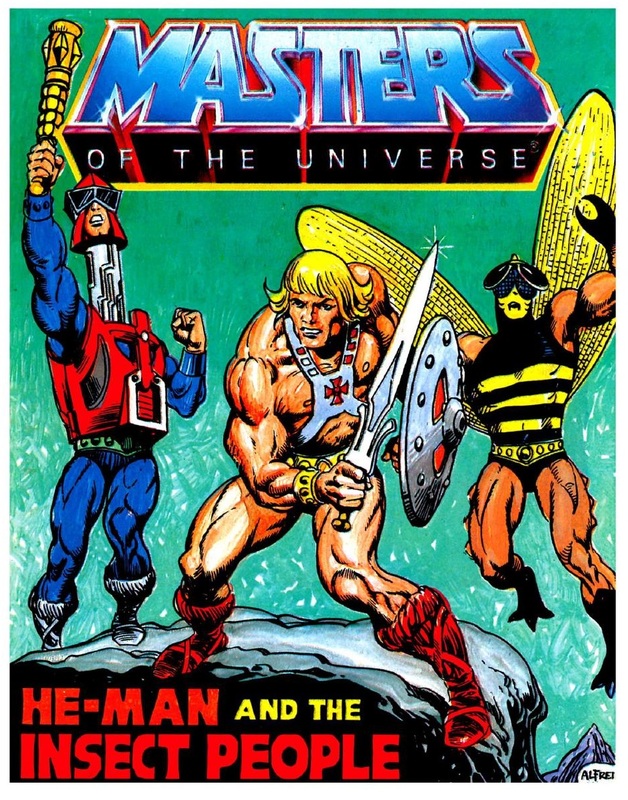 Interestingly, there was a version of He-Man released with brown hair – often called Savage He-Man (or erroneously “Wonder Bread He-Man”), he seems to have been been given out as part of a promotion, but otherwise very little is known about him. He may not have anything to do with Buzz-Off, but I thought it was an interesting little connection. 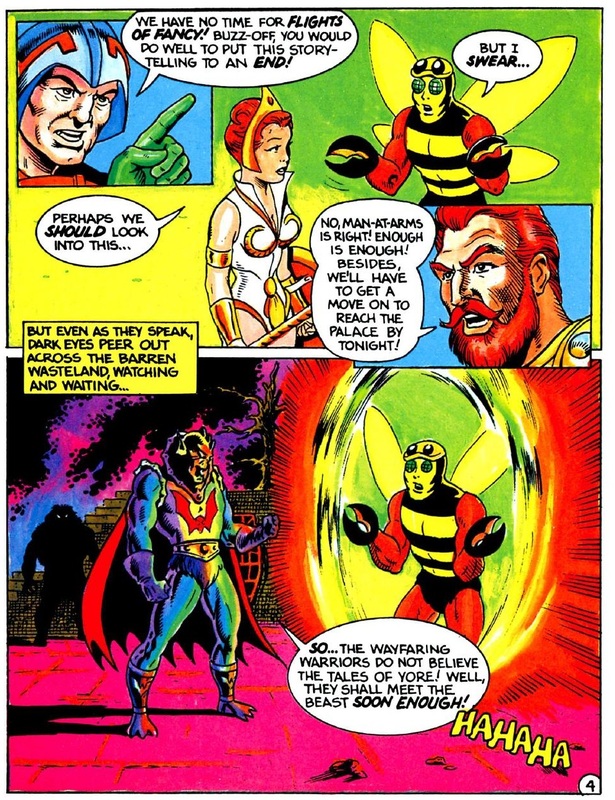 Roger Sweet designed a character called Mandible Man, who seems to fit the description of Bugoff from the MOTU Bible. 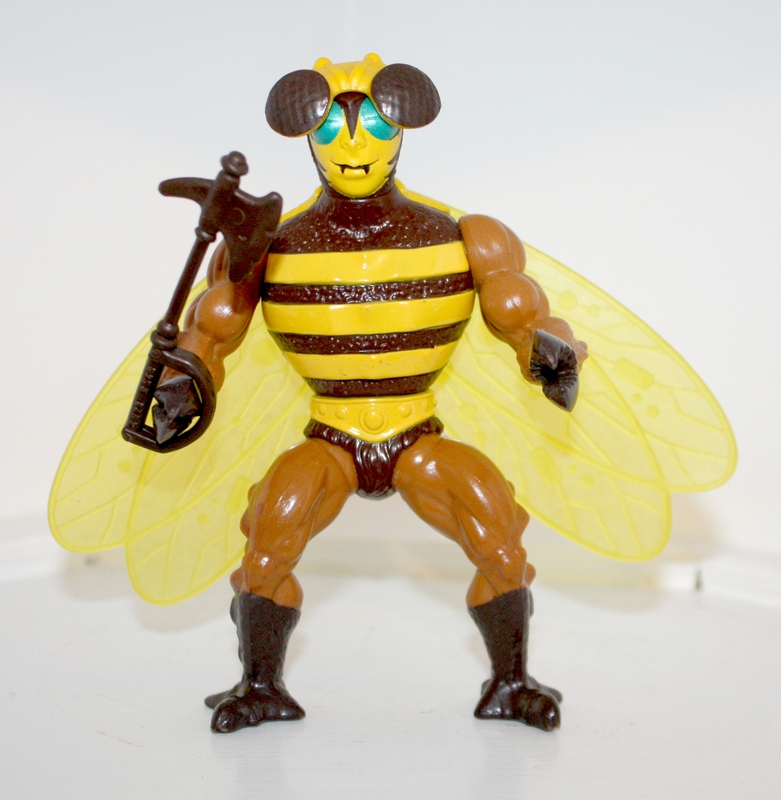 Mandible Man even shares the limbs and torso that Buzz-Off had (also used selectively on Clawful and Whiplash). 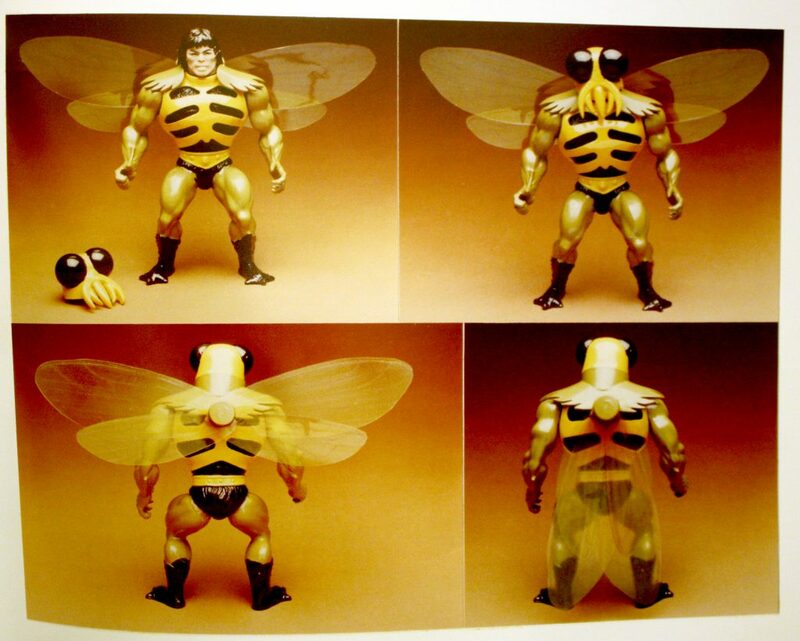 Colin Bailey’s design for Wasp Man don’t seem to exactly match those final sculpted parts, although it certainly looks like an early pass at them. Mandible Man appears to have been made with the exact final sculpted Buzz-Off/Whiplash parts in mind. 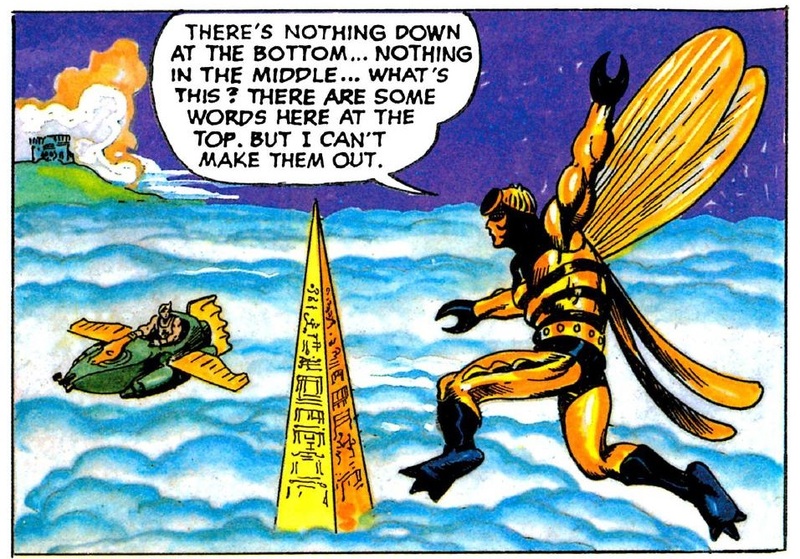 Putting on our historian’s hat, that should tell us this design came after these parts were sculpted, and Wasp Man came before. 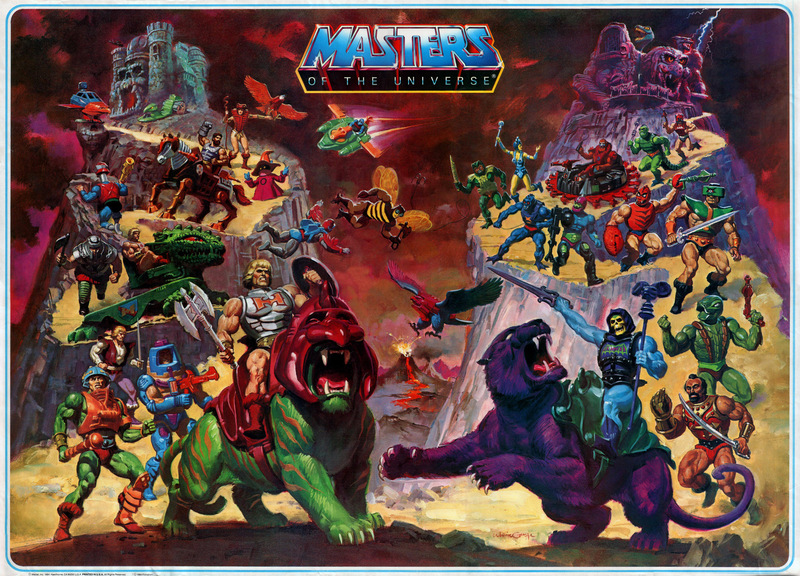 This cross sell artwork used to promote the toy is quite faithful to the design of the final prototype. 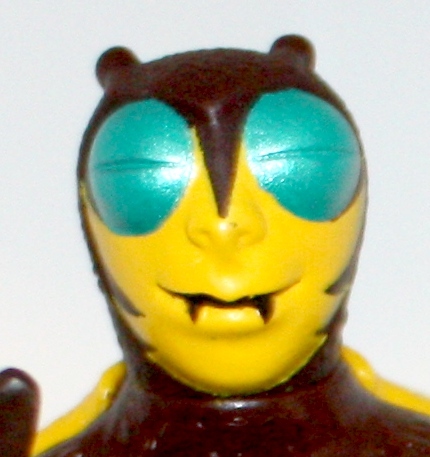 The final prototype itself is identical to the final toy, except for the fact that his eyes here blue rather than blue/green. His clawed arms have the same spiky protrusions as the concept art, although now they look like a part of his anatomy. 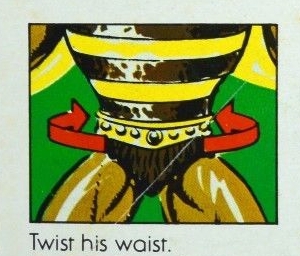 Similar structures were added to his thighs. His helmet was removable, but so loosely fitting that it was easily knocked off. 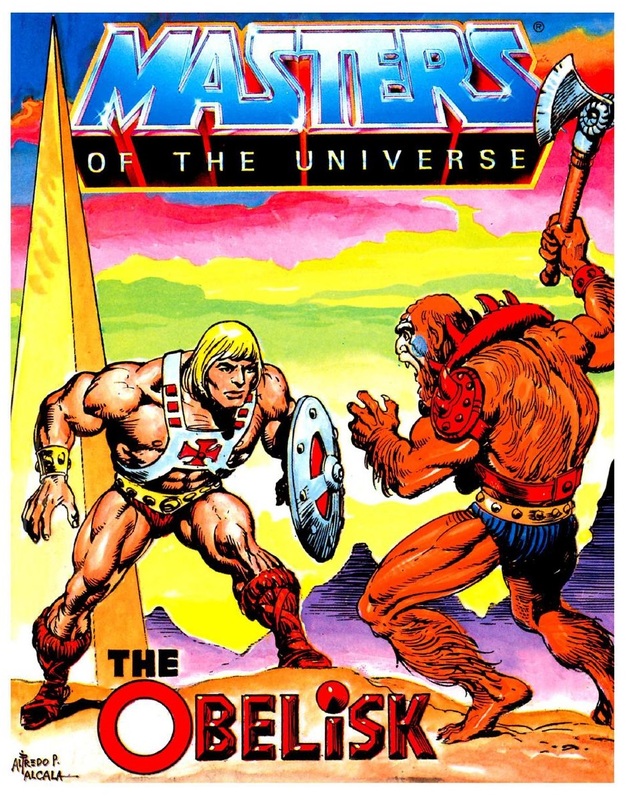 For a weapon he was given a brown version of the axe from Castle Grayskull’s weapons rack, albeit with an extra loop to allow him to hold it. Even so, it didn’t work terribly well – had his claws been rotated 90 degrees, he could have held the weapon much more naturally. 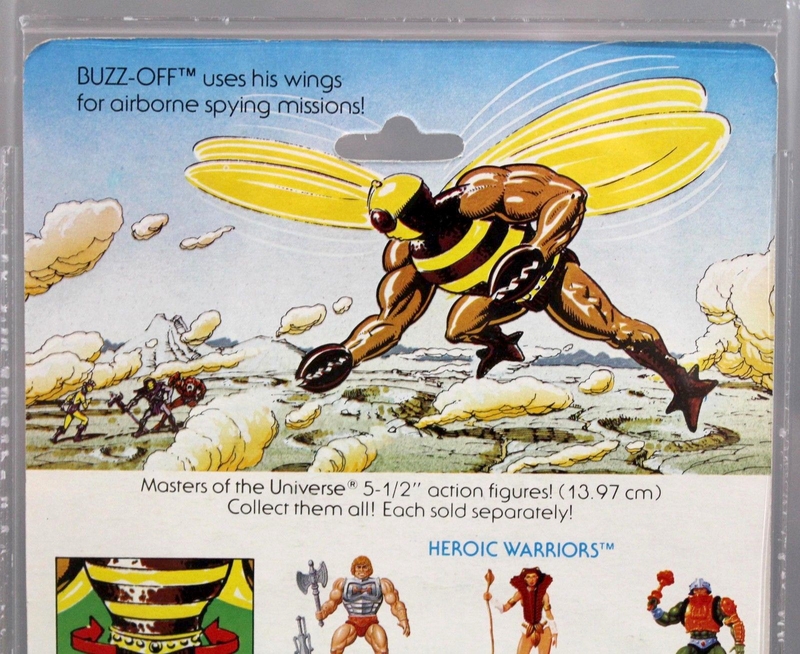 One my my favorite things about Buzz-Off is the design of his chest. 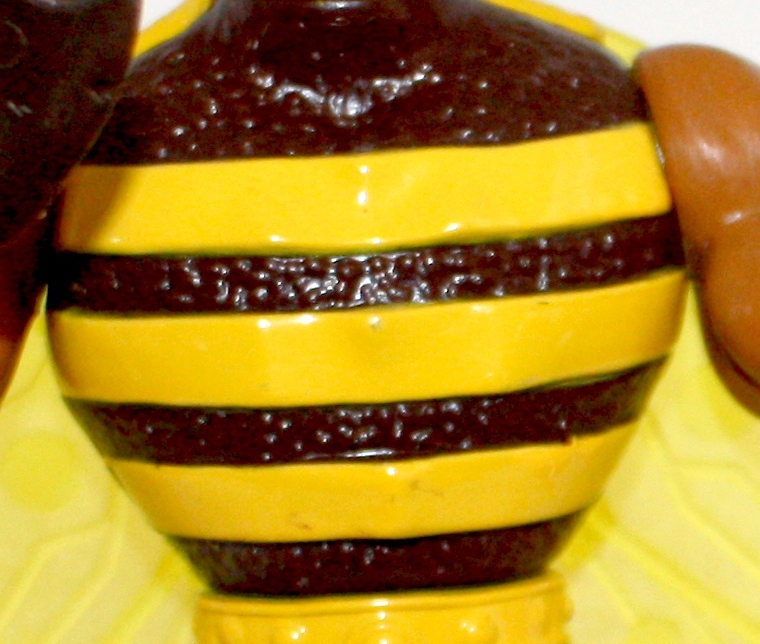 The brown area is covered in little bumps, while the yellow bands that go around this chest are mostly smooth, with a few alternating ridges. That makes him wonderfully tactile in hand. His wings are quite remarkable as well. Cast in translucent yellow, they have little mechanical parts throughout the structure. There are lots of details to discover in this toy. 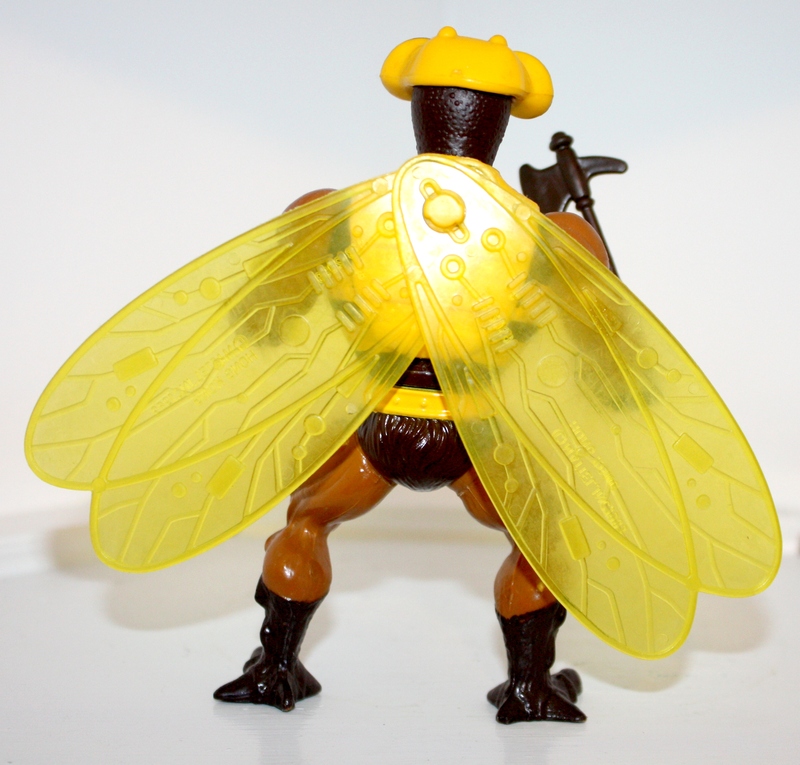 Although Buzz-Off’s limbs are technically new pieces, it is apparent that they were made by modifying the original arms and legs used on He-Man. The musculature, in the areas where there are no added ridges or bumps, is identical. 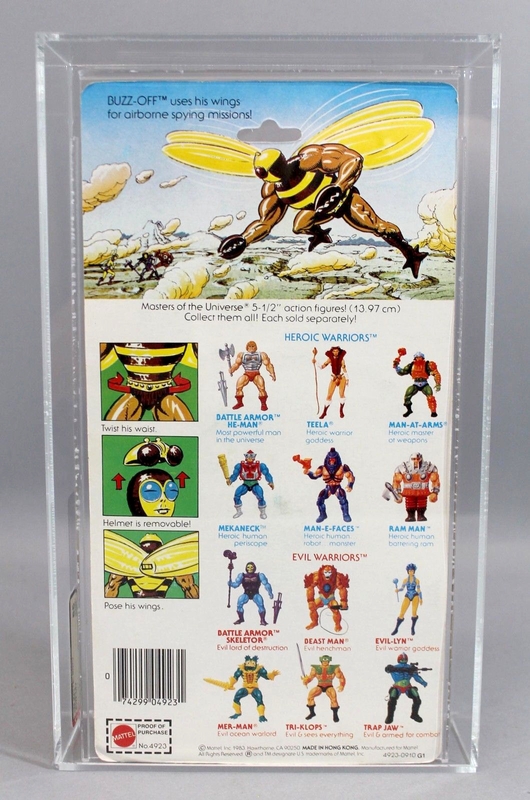 The more common version of the cardback illustration has feet that are closer still to the look of the toy, with thicker toes and clearer delineation between claws and feet. The image is also flipped in mirror image from the original. 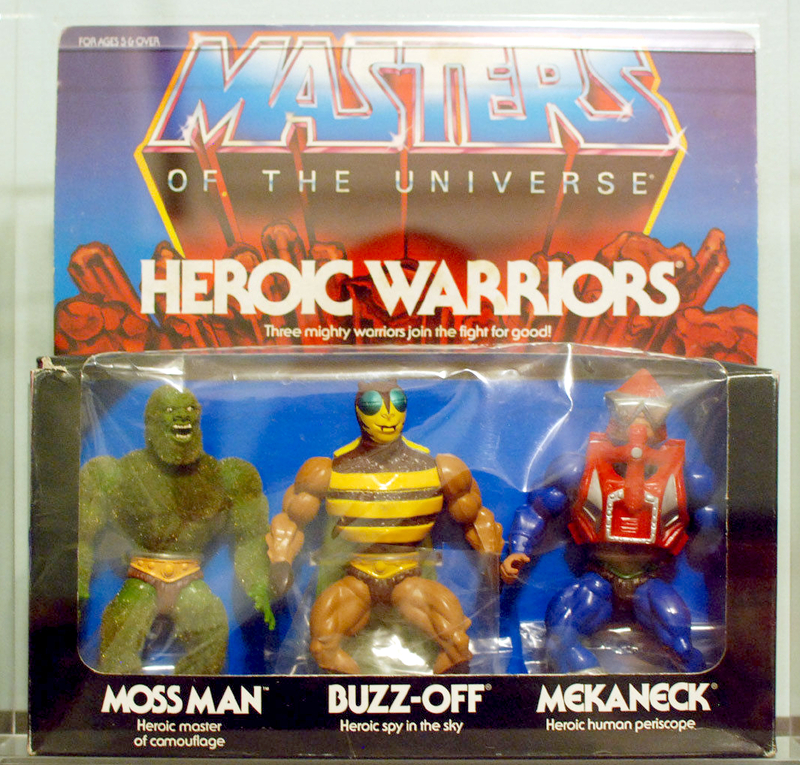 Buzz-Off was also sold in a gift set with Moss Man and Mekaneck, and in a JC Penny two-pack with Fisto. 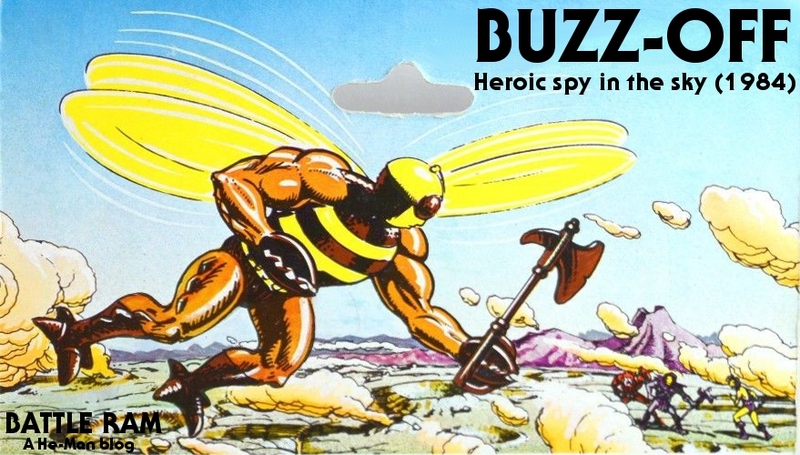 Buzz-Off shows up fairly frequently in the mini comics. 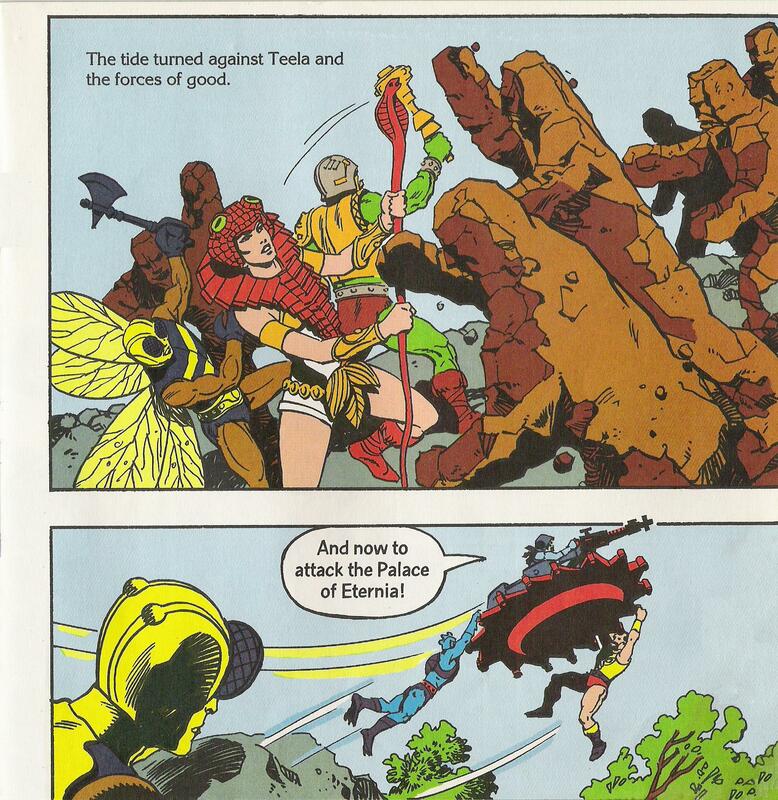 My favorite appearances are in He-Man and the Insect People and The Obelisk, due in large part to the artwork by Alfredo Alcala. 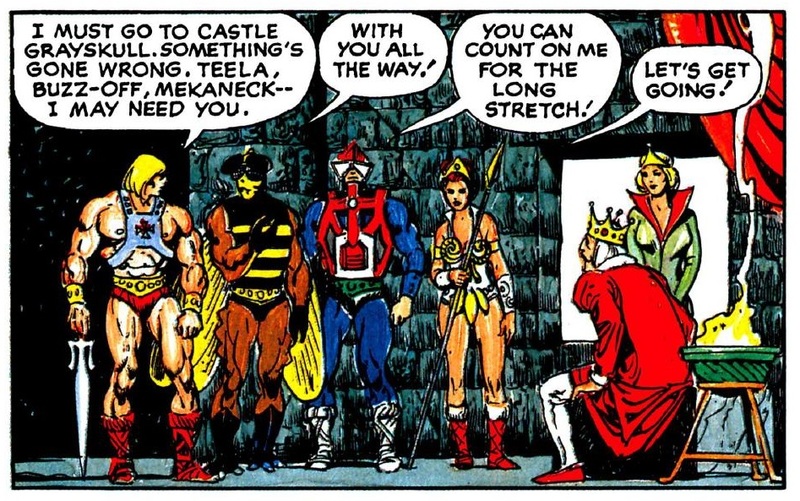 In Insect People, He-Man, Teela, Buzz-Off and Mekaneck discover a race of insect-like people living under ground. 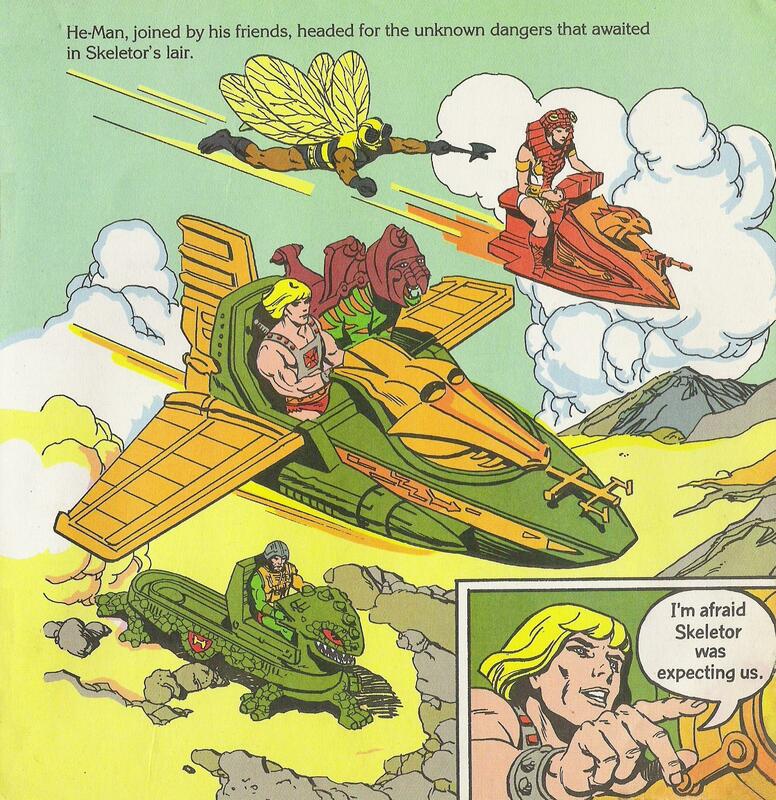 Apparently, however, they are unrelated to Buzz-Off and no mention is made of any kind of connection between the two (mini comic images via the He-Man and the Masters of the Universe Mini Comic Collection). 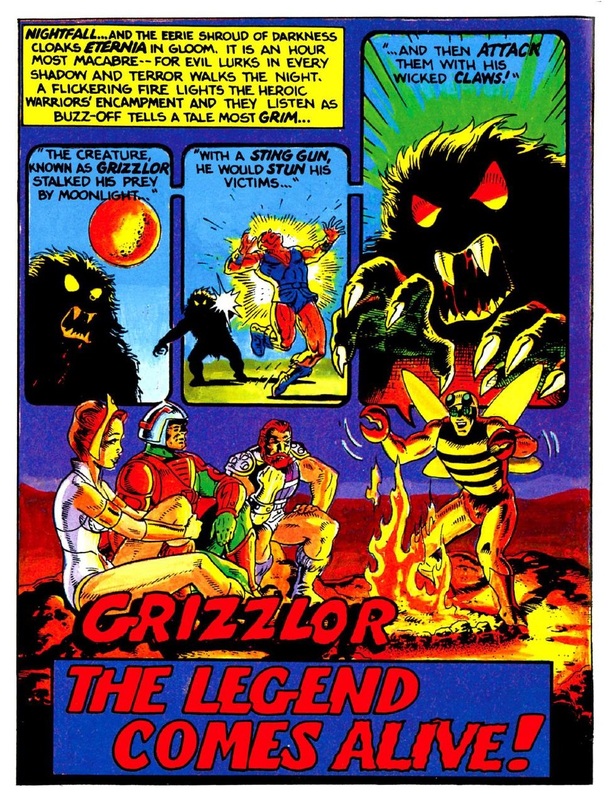 Buzz-Off is also a major character in Grizzlor: The Legend Comes Alive! 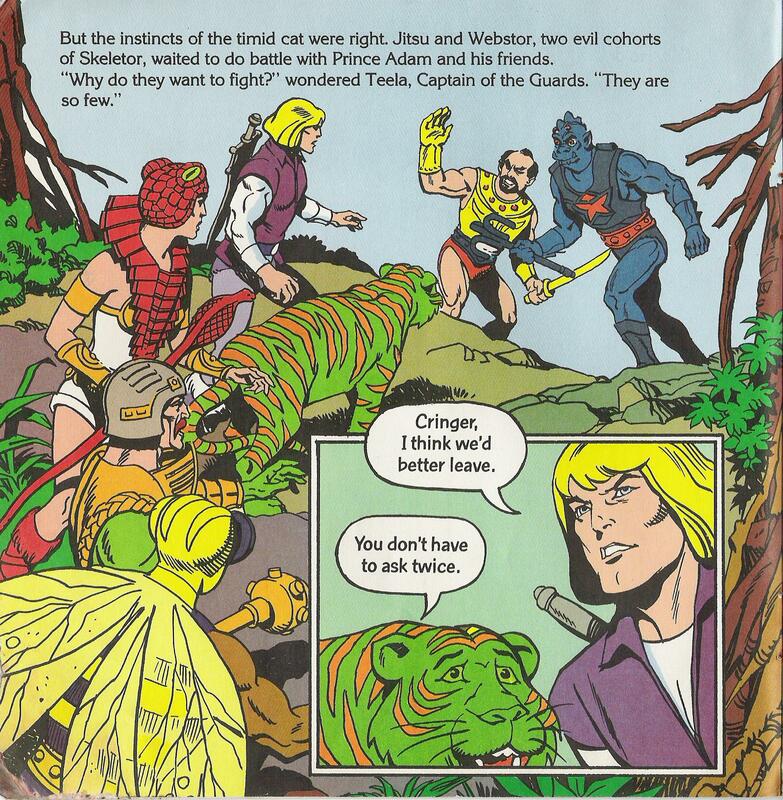 Buzz-Off scares his compatriots (Man-At-Arms, Fisto, and Teela) with a spooky campfire story about a legendary monster called Grizzlor, who turns out to be very real. 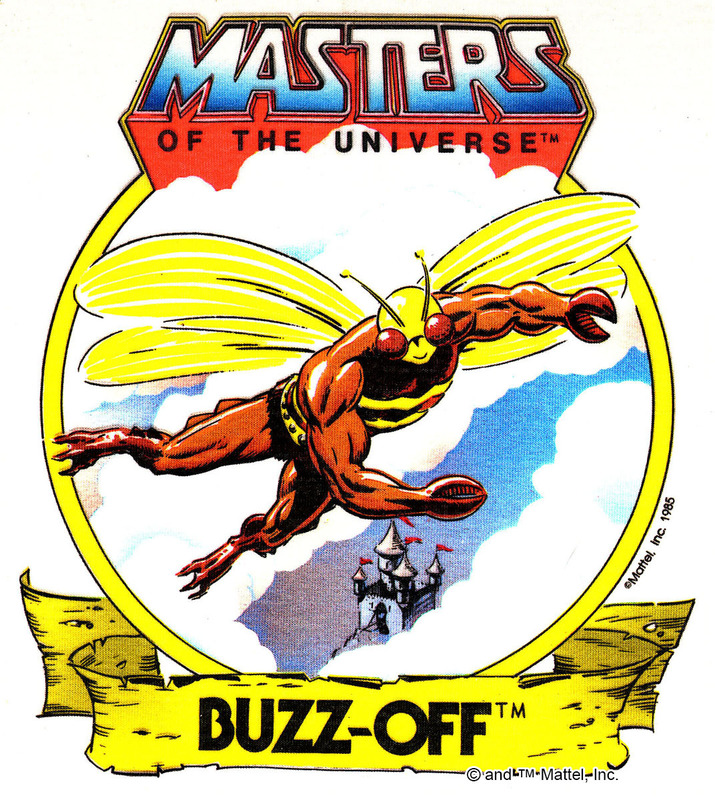 Buzz-Off is a frequent collaborator with Mekaneck, not only in the mini comics but also in the Filmation He-Man cartoon series. 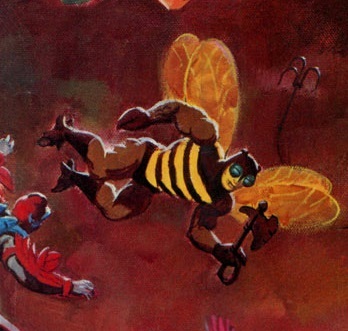 Both of them are supposed to be spies, although in a fight I think Buzz-Off’s claws and axe would come in a lot more handy than Mekaneck’s periscoping neck and ornate club. 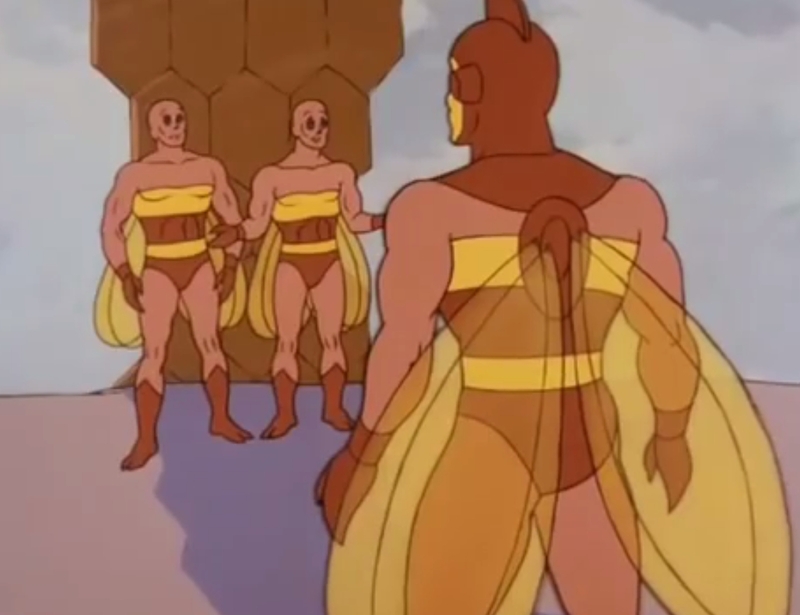 In the cartoon, Buzz-Off is part of an entire race of bee people. This is one of the few times an animalistic character is said to be part of a larger race of sentient beings in the cartoon series. 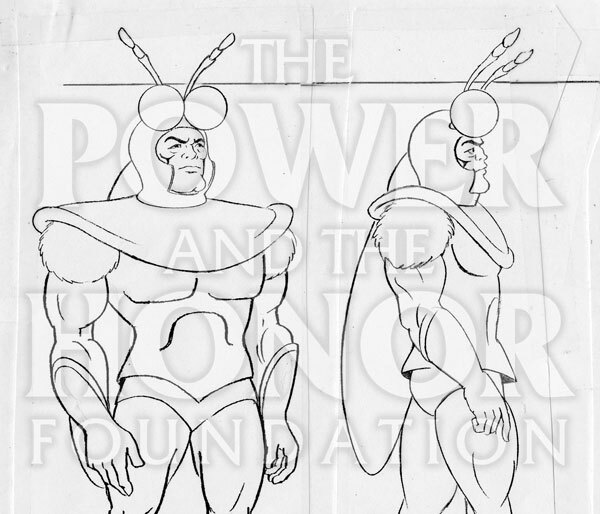 Several years back, The Power and the Honor Foundation shared this early model sheet for Buzz-Off (edit: Dušan Mitrović informs me that this was for Bug-Off), which is based off of Colin Bailey’s original concept drawings. 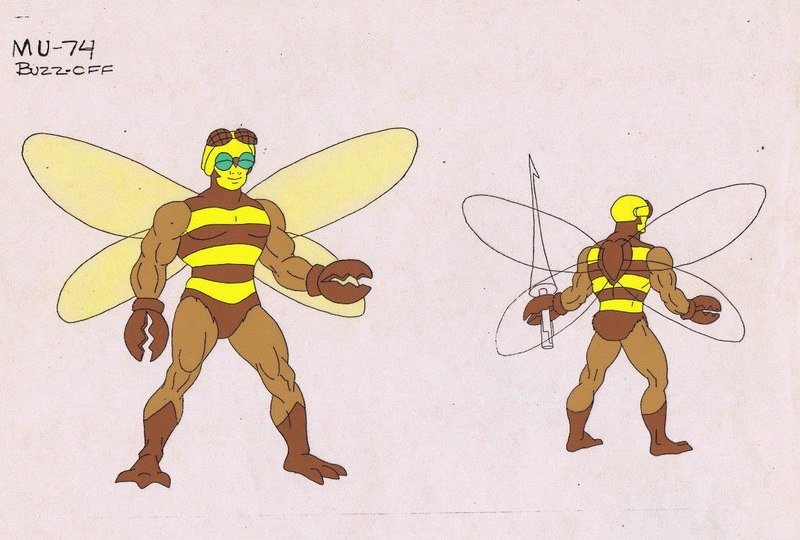 Often Filmation would go with concept designs rather than final toy designs given the lead time required to produce an episode. 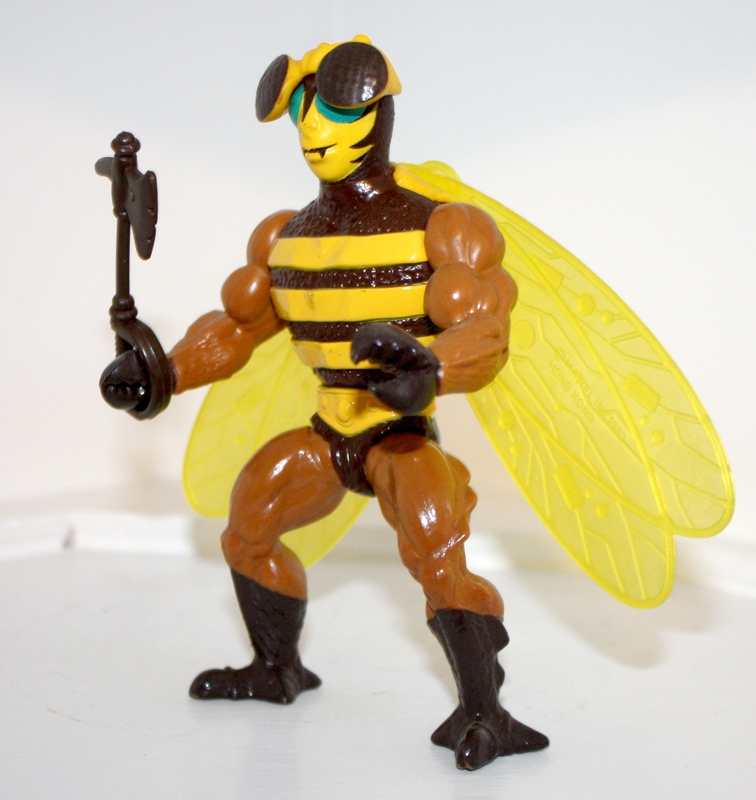 In this, case, however, they ended up going with a simplified version of the final toy design. 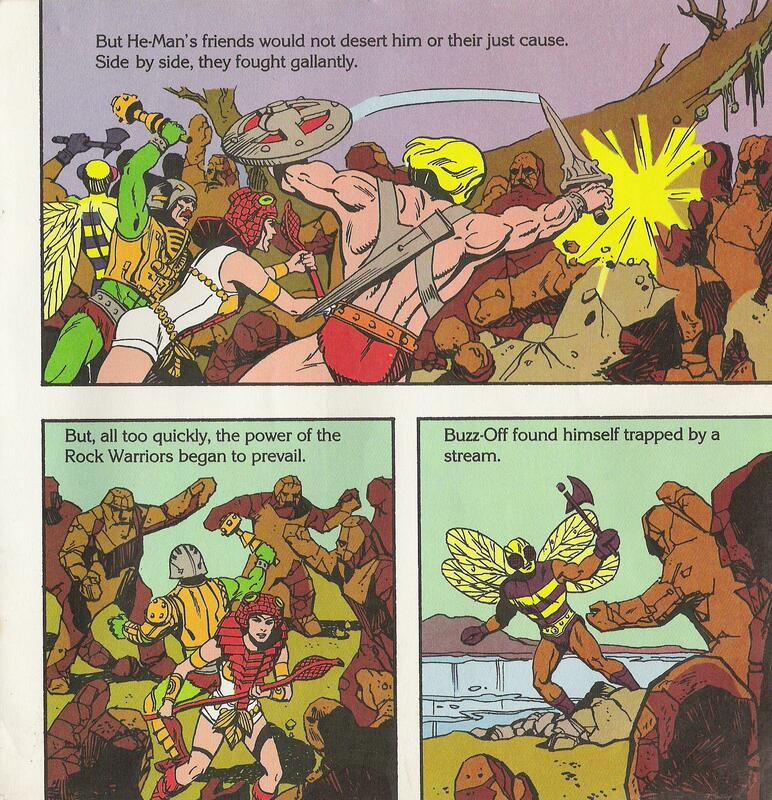 Conceptually, Buzz-Off is not so different from characters like Mer-Man or Beast Man. Like them, he is a kind of human/animal hybrid. 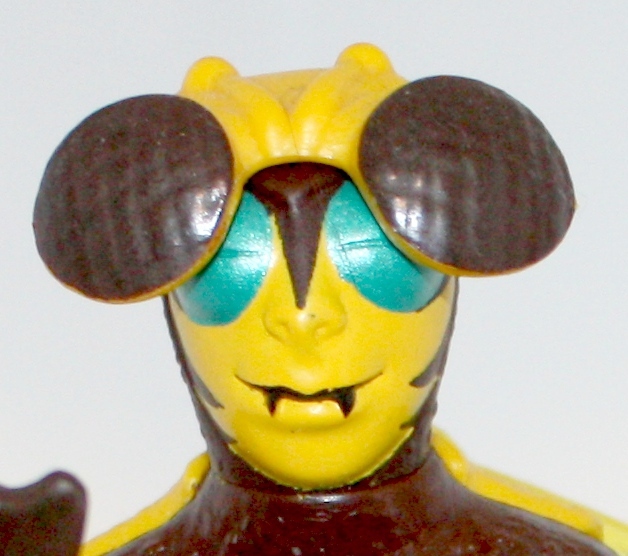 The bee motif does make him seem less serious, but he remains a personal favorite of mine. 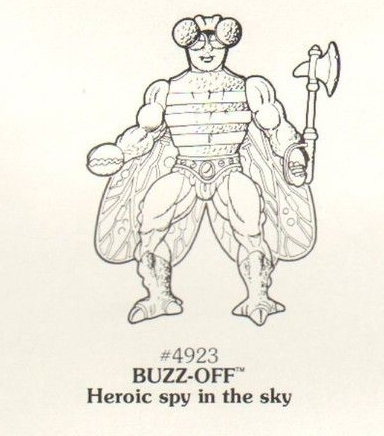 I got Buzz Off as my part of the 1984 Masters of the Universe Christmas, my patents loved to create a theme. He was an afternoon ‘oh look you forgot a present under the tree’ gag. 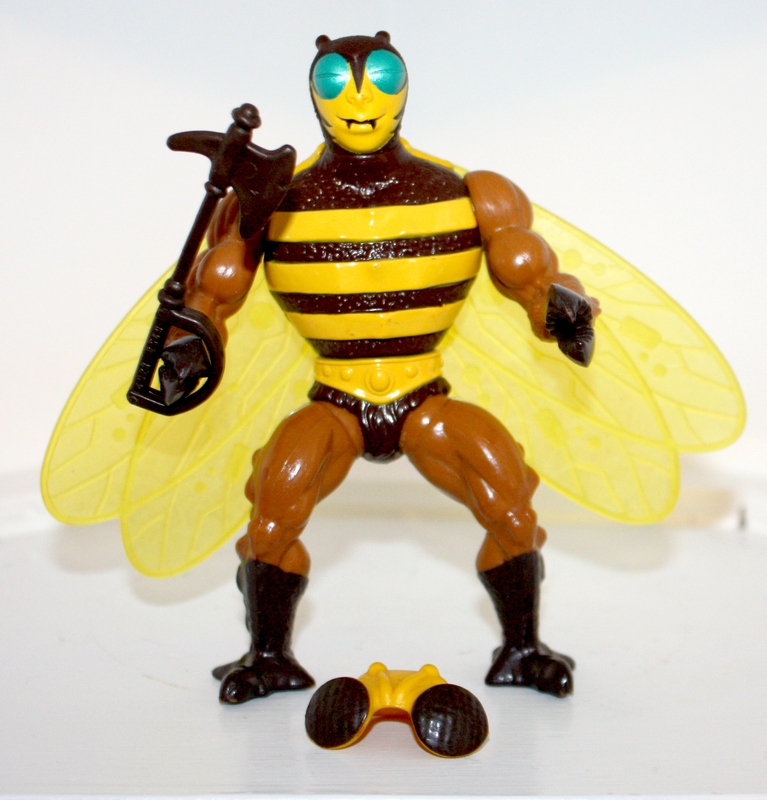 So sadly for poor Buzz, he was often picked last or ended up as part of one of my sisters notorious Barbie tea partys. 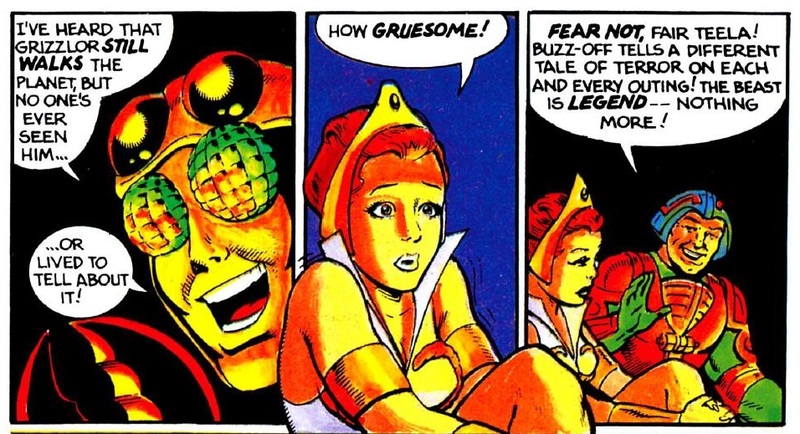 I had that response to Prince Adam, but for some reason I always liked Buzz-Off, even though he’s definitely not as serious looking as the earlier characters. Yup, I was seriously disappointed at getting Prince Adam as a present. Even so, when I got the complete vintage figure recently, I got a pretty strong wave of nostalgia. I guess he left an impression on me. 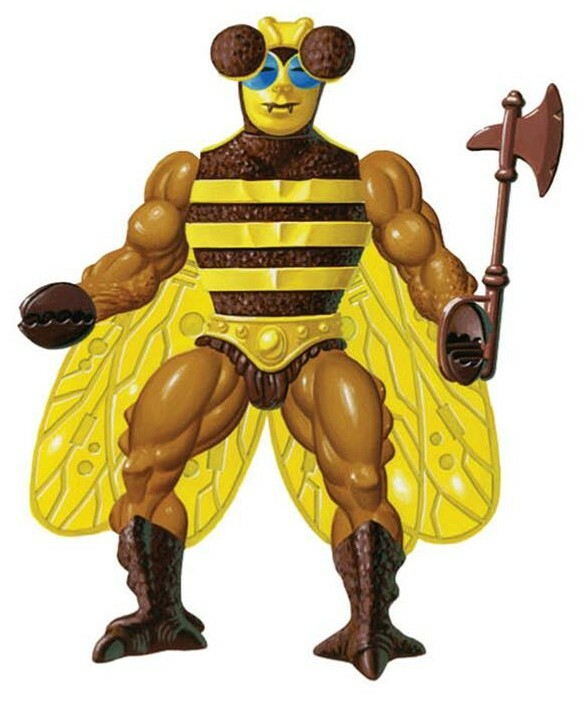 I also don’t really like Buzz Off, maybe if they had spent an extra few minutes on the face/head sculpt, not to mention his helmet, he could have looked at least less dumb. Great read and kick-off post for 2017. 🙂 Honestly, I share Sir Shenigan’s sentiment on Buzz-Off (seen from a kid’s perspective). 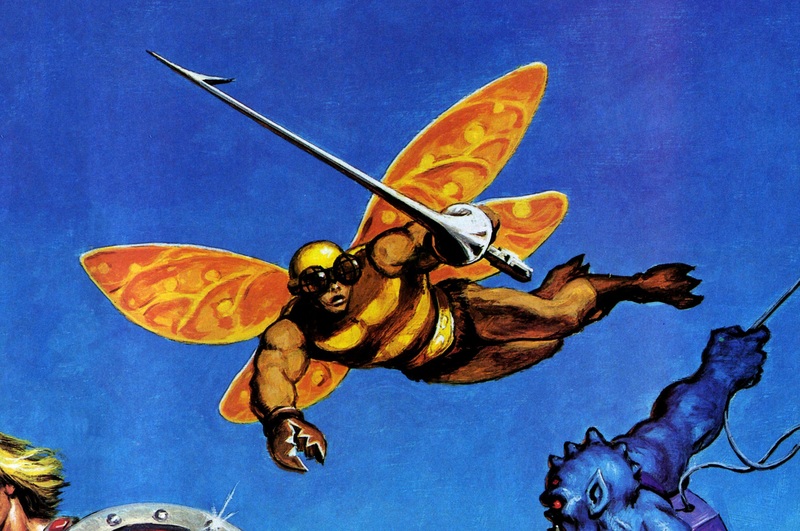 As a kid, I totally liked that there was a character I could fly with. 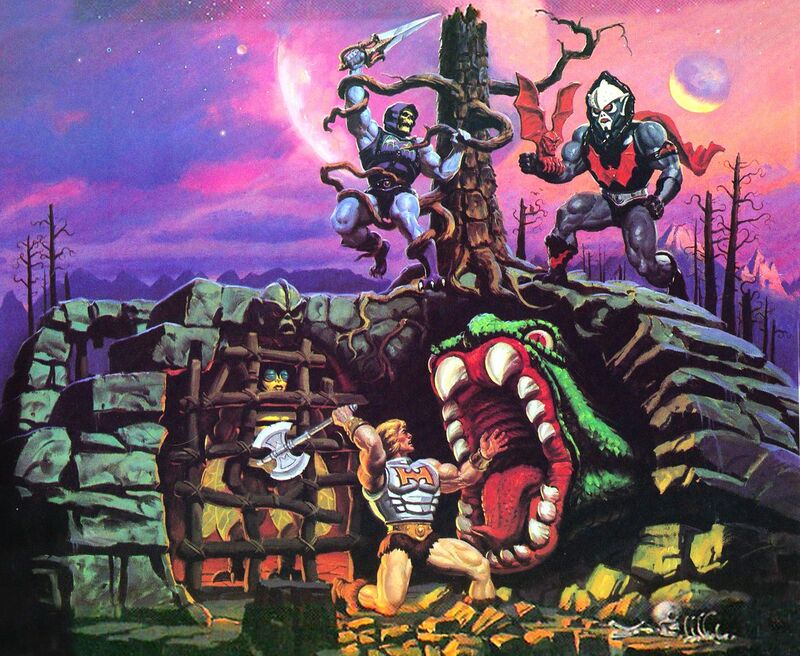 I used BO to make ambush assaults on Skeletor and his foes and stuff. That was real fun. 🙂 I also like (like you, Battleram) that he was designed differently. Liked his wings (bionic design!) 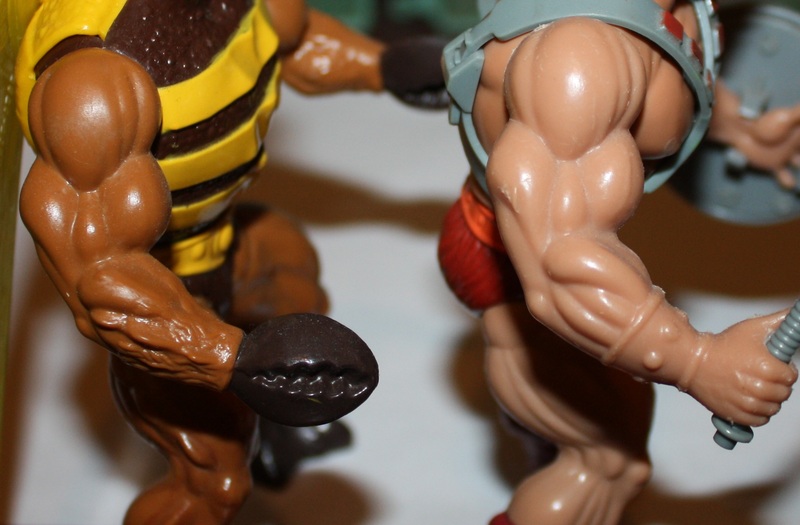 and his Arms/claws. BUT: I will never understand what made this hat pass final quality control! It would Not fit precisely and therefore fall off all (!) the time which is more than unpractical for a flying character. And it looks stupid, more a cap than a helmet. They could have done so much more with it as the prototype shows. 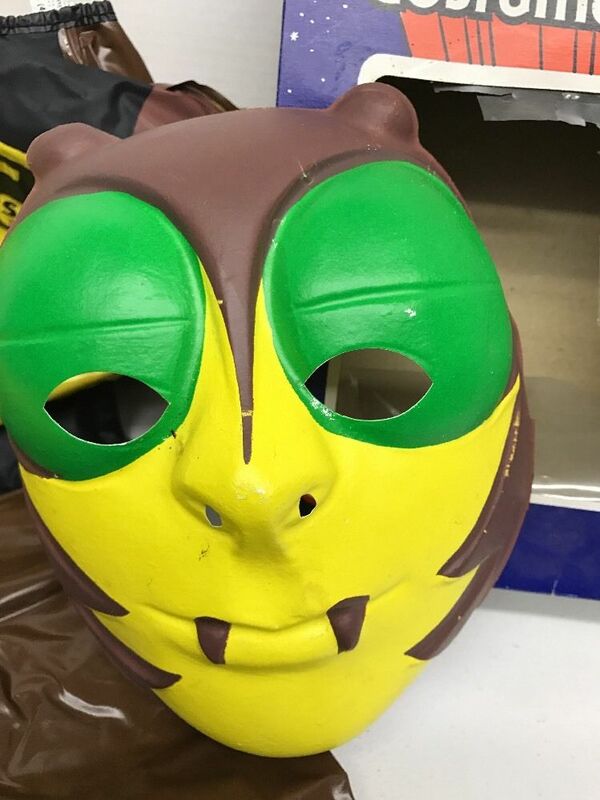 Qualitwise, BO gives proof of that Mattel quality. Even 30+ years later, my figure shines like new. 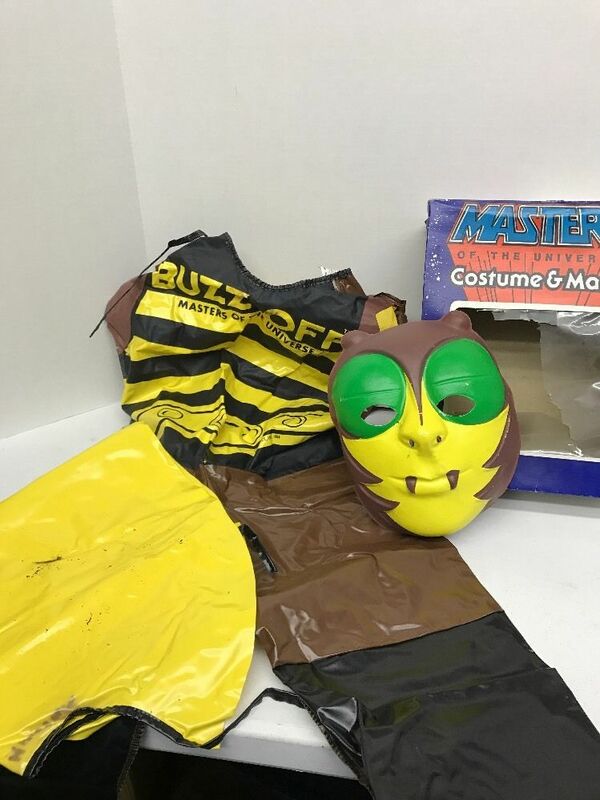 Yes, Buzz-Off has held up really well, quality wise! Agreed about his helmet, it should have fit more snugly. His accessories aren’t great, but I do love the figure. 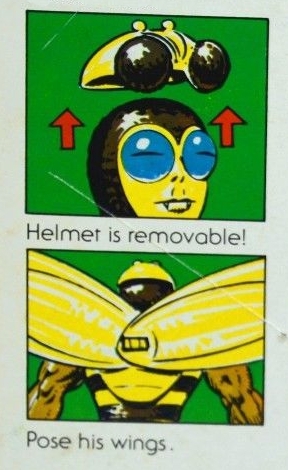 I never used the helmet on mine for the same reason. I fell off if I moved the figure, looked at it, or even though about it too hard! I think it lasted maybe a week before it went to the bottom of the toy box. Interestingly, my Buzz Off’s mace did not have the loop around it, so he was completely unable to hold it. 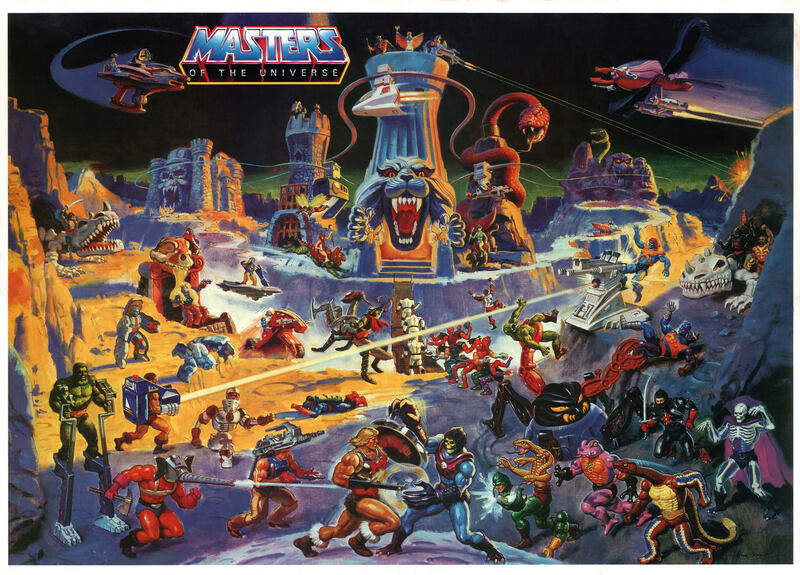 Nice article, I love when you dig all media, sometimes I feel like it would be nice if you expand the article to other era like 200x and MOTUC but I totally understand your approach to keep it vintage media only. 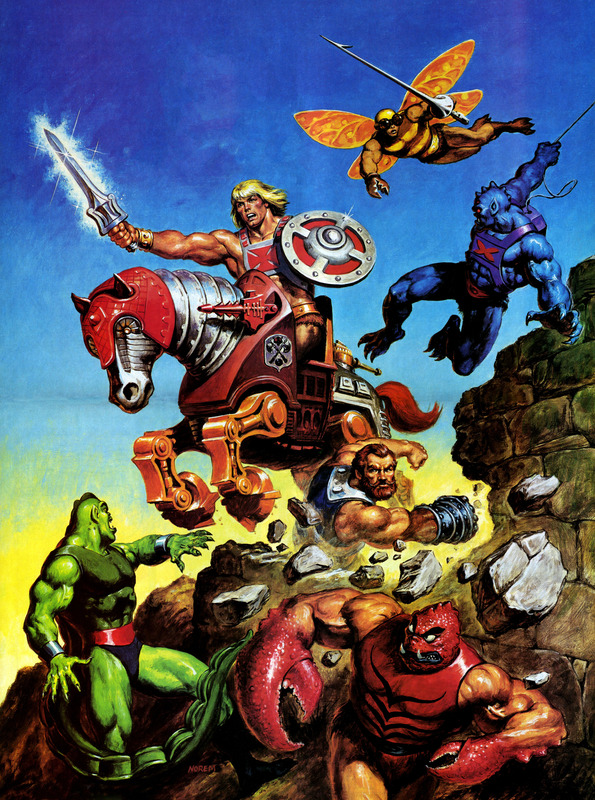 For me Buzz-Off, Prince Adam and anything Great Rebellion is a shame in the masters of the universe Mythos. All Horde characters are nice thou. 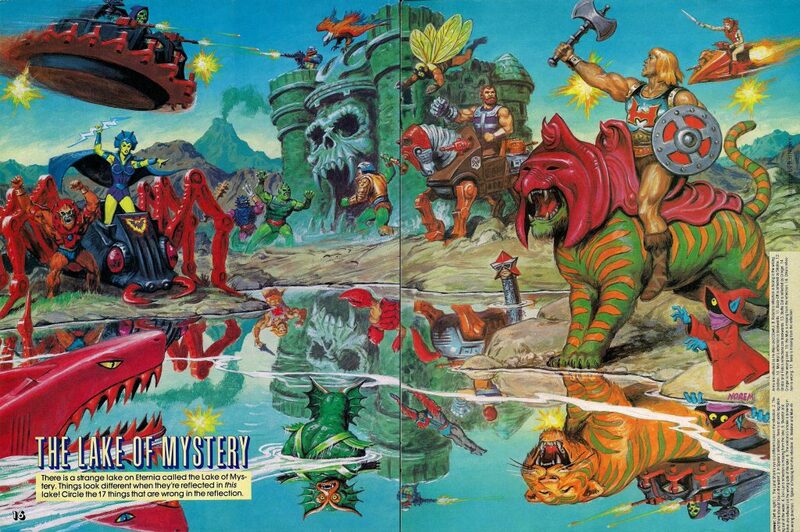 So that means characters like Gwildor, Ninjor and Rotar are not a shame in MOTU? 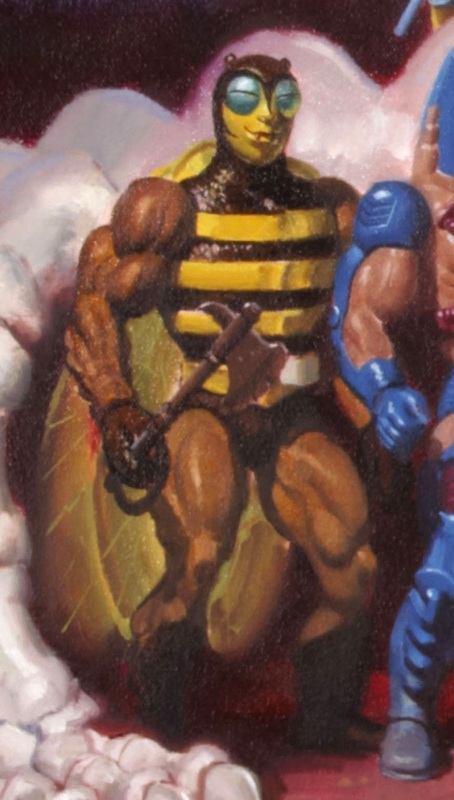 I had my own headcanon origin story for him as a kid: He played a computer game that was about killing bees( like donkey kong 3) and a magic virus infected him and the computer, turning him into a bee hybrid man. 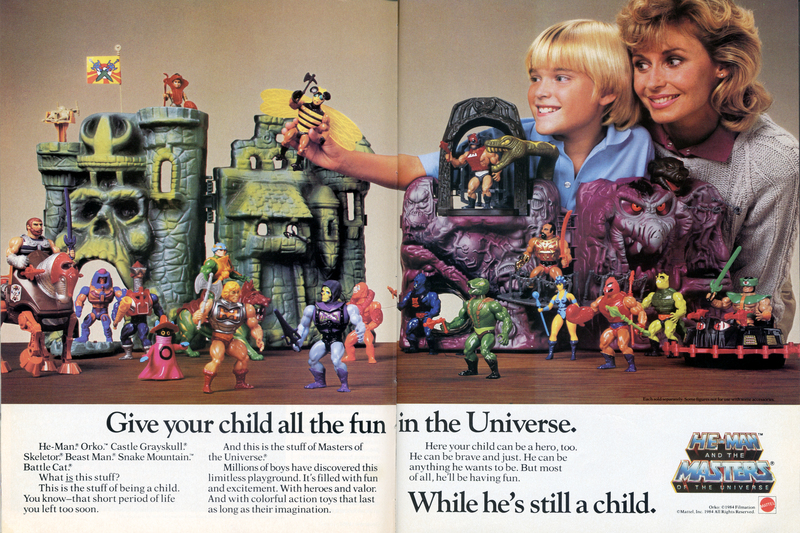 I didn’t like him too much, so my play sessions were like this: He would fly up high and spy on the evil warriors, and use his antennas to tell the heroes what he saw, but Skeletor would intercept the calls and know where the heroes were, and He-Man would get angry and either:throw Buzzoff into a lava pit, punch him in the face, or throw him at the bad guys to be sacrificed. 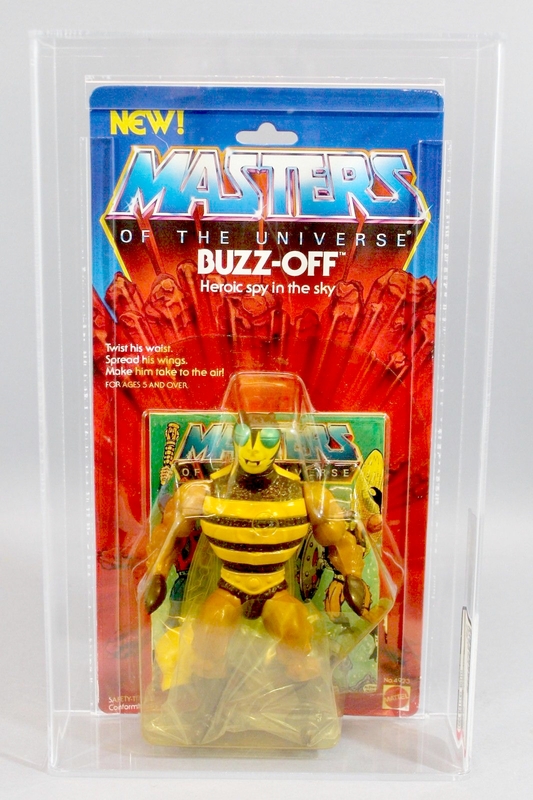 I remember liking Buzz Off quite a bit, though if he’d had that Lovecraftian insect head of the prototype, I’d have loved him a hundred times more! They probably deemed it too creepy, but that would have been right up my alley. That three pack always cracks me up when I see it. Buzz Off’s little smile makes it clear that he’s the one who farted and thinks he got away with it, but Moss Man knows! 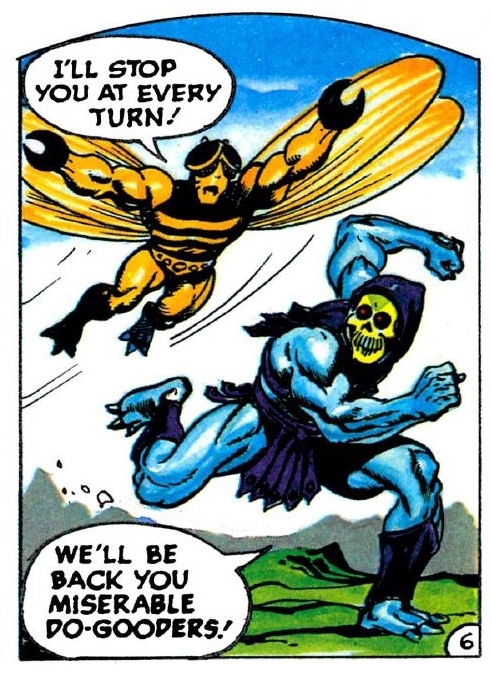 When I was little, I rationalized Skeletor running away from Buzz Off in “The Obelisk” as Skeletor having an allergy to bee stings. 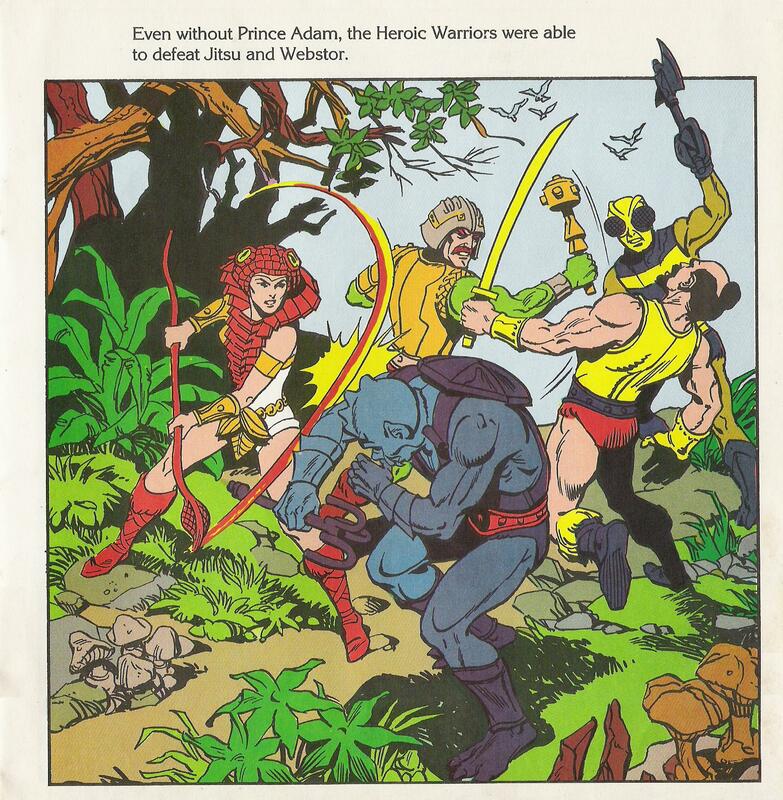 That scene was definitely a low point in Skeletor’s supervillain career. I had quite a few Buzz-Offs during those days of collecting (I think I have a photo on some ancient hard disk; about 14 B-O’s at one point!). He seemed to be one of the figures with fewer variations (though they’re not unheard of). One of the Buzz-Off’s I had, had the wings on back-to-front, in that the detailing was facing the wrong way around; not sure how common a factory fault this was or if it was literally a fluke one-off (sadly can’t remember it’s country of origin). As with many people it seems, I never much liked his helmet – it would fall off with as much as a tap, and in all honesty the figure didn’t need it, as it just looked clunky with it on. 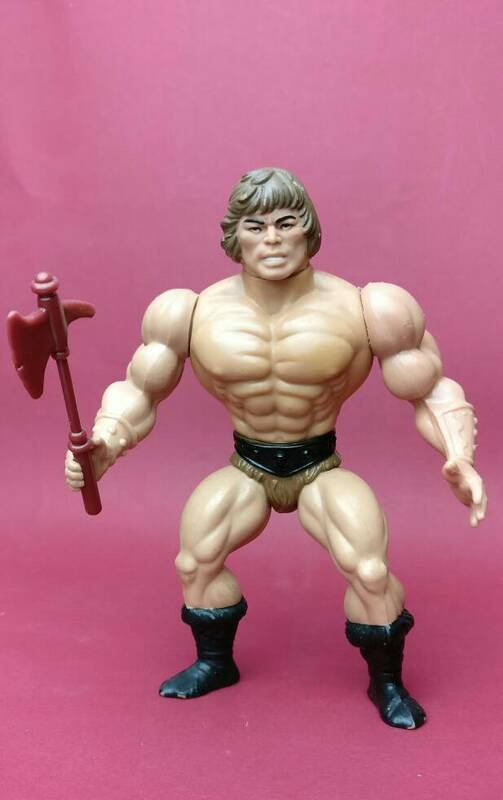 As with Clawful, whom I’ve already commented on, the cheaply recycled Grayskull weapon, with the added handle “to stay on the claw”, never remotely stayed in place. 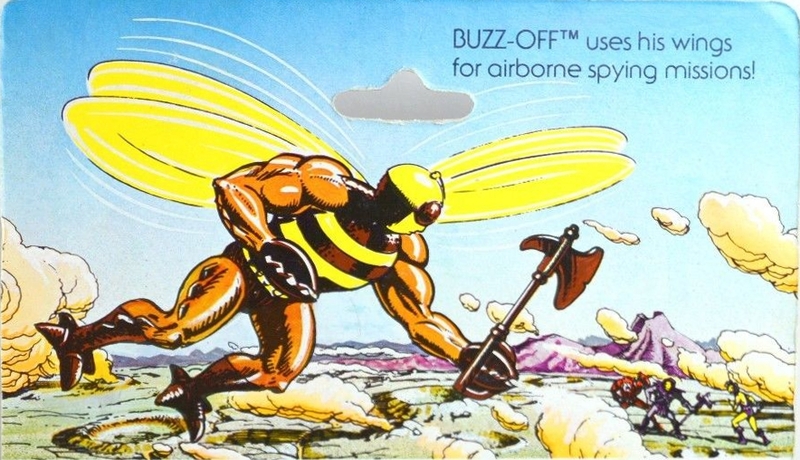 Instead of the pointless helmet, shame they didn’t put resources into creating a better weapon for Buzz-Off instead. And he never really seemed that well suited to the ax – I always wanted to see him with a lance or spear (as a few promotional illustrations also showed him with) to act as his ‘sting’. 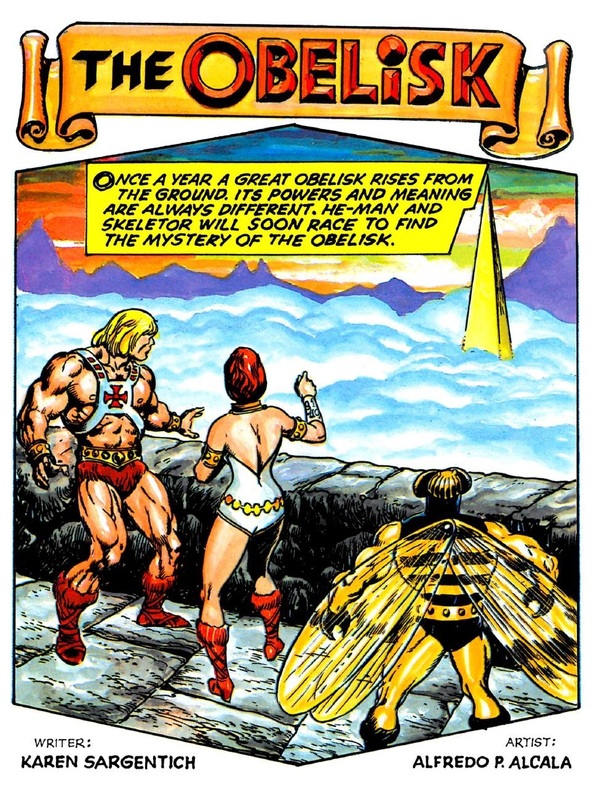 In fact, Grayskull had a spear (as was recycled with Whiplash) – giving Buzz-Off that would have made more sense. 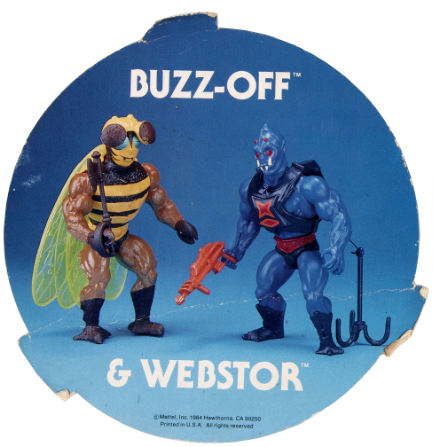 As much as I love weapons and accessories with MOTU, Buzz-Off was one who was better played and posed just one his own, minus “never gonna stay there” ax and silly helmet. The 200x version of Buzz-Off was one of the few of that line that I really liked. He actually looked very different… almost wasp like… and I much prefer the chunky, “cheerfully goofy” look of the original, but at least he was a figure they did something with, and not in that warped anime way that ruined so much of the 200x line for me! His 200x weapon was a big step up from the rubbish original, too. …I really need to start my own blog. Too much to say on every damned figure! !